My team has been doing some fabulous creating, and they’ve generously given me permission to share what they’ve been doing! I love sharing everyone’s creative projects; you may recall last week I shared Margaret’s fold flat boxes – you can read that post HERE, and see what she created. This week, Lynn K. was super busy making projects for her friend’s special birthday – and since I’m pretty sure her friend Robin doesn’t follow my blog, we’re going to share them with you today! 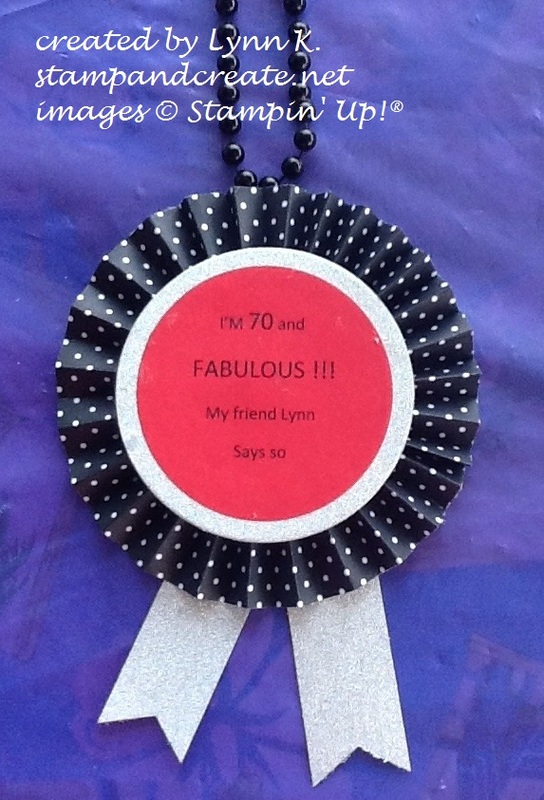 Lynn knows that her friend’s favourite colours are red and black, so that’s the combination she used for her projects. First, she wanted to make sure that everyone knew it was Robin’s birthday – and that it was a special one! Next, Lynn created treat holders for all the party guests. She had seen the one that I created using the Detailed Floral Thinlits (you can see that post HERE), and wanted to recreate it, using red & black, to coordinate with the rest of the party decorations. To complete the treat holder, Lynn added some red ribbon, and used the Bird Builder Punch (since Robin also likes birds) to create the little bird and stamped ‘thank you’. They aren’t in this picture, but Lynn also found some truffles that were wrapped in red & black foil – perfect for putting in this little holder! Of course, no birthday celebration is complete without a handmade card! You can see that Lynn stayed with her colour theme of red and black, and added some lovely contrast with the Whisper White and green. Using a non-SU! 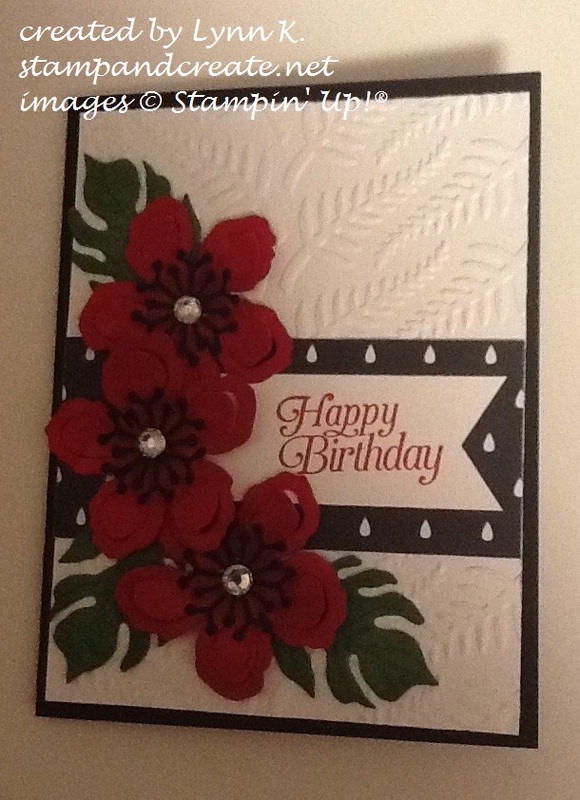 embossing folder, Lynn embossed the Whisper White panel, then added a strip of the retired Everyday Chic DSP on top, and added a banner stamped with Happy Birthday. Lynn created the gorgeous flowers using the Botanical Builder Thinlits in Real Red and Basic Black, and added some bling with the Rhinestone Basic Jewels. What a beautiful card! I’m not sure if this next project was part of the birthday ensemble, but Lynn also tried her hand at the fold-flat box, and it turned out great! You can see my original post, with links to the video, by clicking HERE. I don’t know where Lyn found the watermelon paper, but it sure is cute! 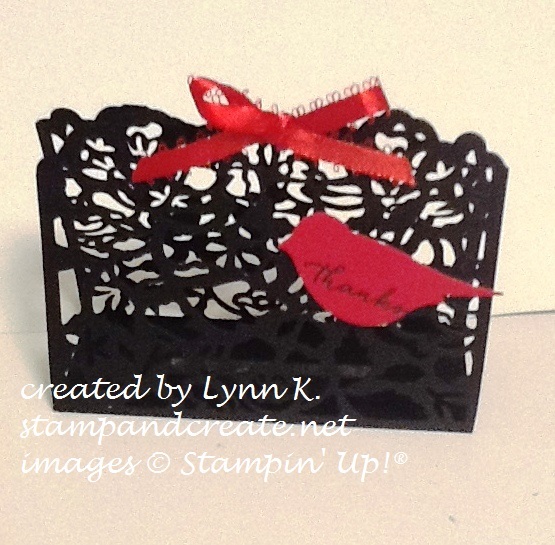 Of course, we have our Stampin’ Up! 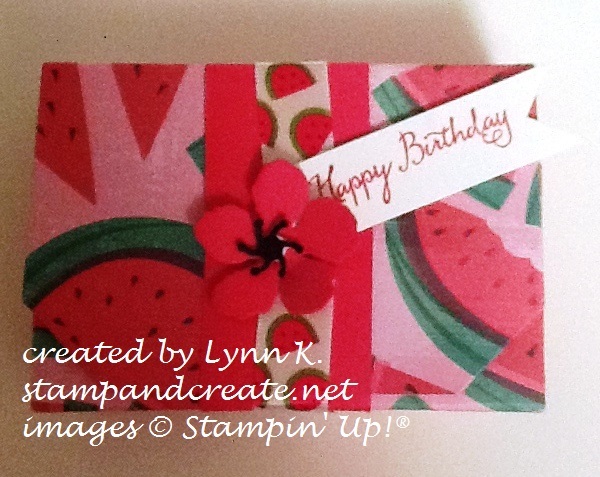 Fruit Stand DSP if you’re wanting fruit themed paper, or you could create your own watermelon images by stamping with the Work of Art stamp set onto Whisper White cardstock. Lynn decorated the belly-band for the box again using the Botanical Builders Framelits to create the flower. Next Next post: Time to Redeem! I am the Robin who Lynn Klemionek designed and made all the beautiful gifts for. What an exciting parcel she mailed to me in New Zealand for my 70th birthday. My friends here have seen nothing like this before. I wish Lynn could have stowed away inside the box. You are teaching really fabulous crafts in your classes. Hello Robin!! How fabulous of you to share a comment about Lynn’s amazing gifts for you 🙂 Lynn is a wonderful paper crafter – she made some beautiful gifts for you. It’s great to hear that you enjoyed all of them – I hope you had a very Happy Birthday 🙂 (I don’t know if you remember, you did come over with Lynn once, I think it was to one of my open houses. It was such a pleasure to meet you).